The Claw in Seattle, June 4, 2011. Photo by atu2. 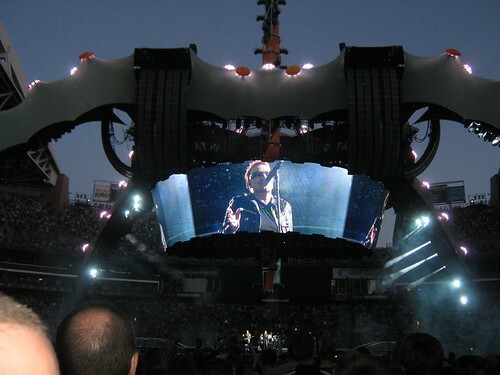 Fans who attended concerts on the U2 360 tour from 2009–2011 experienced the massive stage prop, fondly dubbed “The Claw,” looming over each show. Many thought they’d never see the mammoth contraption again, but they’ll soon get their chance as it was recently sold to Salt Lake City’s Loveland Living Planet Aquarium. If it seems like an odd place for a concert structure to retire, you may want to reserve judgment until you read on. In the following Q&A, conducted via email, the aquarium’s founder and CEO, Brent Andersen, shares deeper insights about how it all came about and what ideas are being explored for its use. TEK: I heard you attended your first U2 concert during the PopMart tour. How long have you been a U2 fan? BA: That is correct, the 1997 concert at the Coliseum in L.A. was the first U2 concert I ever attended. I liked their music before that, but I really appreciated it more after that concert and have enjoyed all of their music ever since. TEK: Tell us about how you envisioned this project, stemming from your trip to Barcelona to see the band on the 360 tour. BA: If you have ever seen that massive structure in person, you can attest to how impressive it is. When I saw it for the first time in Barcelona, I literally stopped in my tracks and marveled at it, and held up the line of people behind me! I saw the complex engineering, and the amount of work that must have gone into designing and building it. I tried to imagine how they got it into the stadium, and how it was going to work as the stage for the concert. But, I didn’t view it as merely a functional piece of stage architecture, to me it was a dynamic sculpture and a work of art. I remember vividly that it elicited emotions of reverence and awe. It has numerous facets to its nature and many of those were contradictions. Its scale and grandeur were very imposing yet at the same time it was inviting. It is absolutely massive yet feels lightweight, fierce yet beautiful, powerful but delicate, and that was in the daytime! At night it came alive with the lighting and effects that absolutely captivated everyone. TEK: When did the conversation begin to acquire The Claw? Were negotiations ongoing all this time, or was the idea shelved and revisited? BA: Our conversations about bringing the stage to become part of our Science Learning Campus started in November 2016. We spent a lot of time talking about compatibility and suitability as part of our Science Learning Campus, how we could integrate it. We looked at the ways it could help amplify and bring attention to our mission of teaching people about our Earth’s ecosystems, and the fact that they are all just one GLOBAL ecosystem, our Living Planet. We then took a few months to have a feasibility study done and spent quite a lot of time with the engineers and our design and architectural team to make sure we could turn it into a permanent structure in the various wind and environmental conditions. We then spent several more months with architects and exhibit designers fine-tuning the overall plans and making sure everything would work well together. We explored and added additional ways to provide our visitors with a rich multi-sensory experience, all geared toward teaching them how the world’s ecosystems (marine, freshwater, rain forest, desert, Antarctic, etc.) work and how they all are interconnected to form our Living Planet. That 1½ years seems like a long time but this was a large endeavor with many different aspects to consider and to find ways to make it all work cohesively. TEK: The only part of the original structure that won’t live on permanently at Loveland is the video screen. What’s the reason behind that? BA: The LED components of the screen had already been repurposed, but although we wanted to integrate new LEDs, the complex Hoberman-designed mechanism is rather difficult to maintain in our weather (thousands of joints and connection points) and the wind load tolerances would have limited the amount of time on a given day that it could have been up and running. We are however looking to work with LED fabricators on a plan for designing a lighter weight “curtain wall” of LEDs to achieve a similar functionality and overall effect. TEK: Speaking of weather, Salt Lake City is known for some frigid temperatures. What will be done to protect The Claw to withstand different conditions and exposure? Can you give us any details on the work that needs to be done to refurbish it? BA: This was one aspect our engineering and design team spent a good deal of time on to come up with a solid long-term plan. It ultimately involves bead blasting and repainting the massive steel structure with a three-step epoxy and UV shield that will make it compatible in the climate here, and give it more than a 25-year life before it needs to be repainted. The “skins” on the legs and structure are of a new, very durable tensile fabric that works in our environment and is seen on outdoor structures around the world. The LED lights will be some of the latest and most efficient available and will recreate the capabilities seen on the 360 tour. TEK: When it was on tour, the structure took just a few days to construct. How is the process different when its placement is intended to last decades vs. days? Will any of the original U2 crew members be on hand to assist? BA: Most of the differences come in the form of creating a permanent footing and foundation system. Our team was able to come up with a great system that works with the existing design of the structure. We do anticipate that members of the original crew that assembled and moved the stage will assist on installing it in its permanent home. TEK: It sounds like The Claw will serve many purposes in its new home, from films to play areas for children. Any plans to have some U2-themed events when it first opens, so fans can revisit memories from the tour? BA: It will have many aspects to its new life just as it did as the largest stage in music history. One aspect is helping us teach about conservation and sustainability. The floor of the round stage will actually be the ceiling of a building beneath it. It will be a highly detailed thematic experience called the Eco Command Center, and will combine elements from escape rooms, simulators, and team building activities. Through digital content and virtual reality technology, explorers will embark on science and ecology-based eco-missions around the globe, ranging from deep oceans and rain forests to deserts and Arctic regions, requiring real science practices and teamwork to successfully complete the missions. We can use this as a high-tech way to teach about conservation and sustainability and practical ways that we can all take care of our planet. We saw early on in talking with the team that we had a kindred interest in those areas. I think most people are aware of the efforts the band members have made around the globe in the areas of conservation and sustainability. Their dedication to sustainability really came to the forefront on the 360 tour, where they found ways to minimize the carbon footprint of putting on such a tour, and then provided carbon offsets that brought the entire three year tour’s carbon footprint to zero. They continued that commitment with the Innocence + Experience tour and even expanded the impact so that in the years subsequent to the tour it generated an additional offset three times that of the impact. That is just the type of leadership by example that we need around the world to address the challenges we are facing as a global community. The Claw, as one of its facets, will be an extraordinarily visible example of recycling, conservation and sustainability. In terms of U2-themed events we don’t currently have those planned but are open to ideas and the numerous possibilities. We would love to hear from the community about the type of events they would be interested in. TEK: Is there a projected opening date? Will U2 be invited to attend (or perform)? BA: Yes, we anticipate being able to unveil The Claw and the plaza portion of our Science Learning Campus in late Summer 2019. Everyone is asking about the possibility of U2 attending the ribbon cutting next year, and though there are no plans for a U2 visit or performance as of now, the invitation to them is always open and we would welcome them at any time! TEK: The Aquarium is still raising money to make this project a reality. If folks want to contribute directly to this project, is the GoFundMe page the best route? BA: As a 501(c)3 nonprofit organization we have launched a part of our fundraising campaign on GoFundMe.com/LivingPlanetAquarium. This gives everyone who would like a chance to participate an opportunity to make this iconic stage a permanent attraction. So if you want to donate, have your custom-engraved brick in front of the stage or even a custom engraved plaque on the stage itself, you can be a part of preserving a part of rock history and supporting a nonprofit organization at the same time. The Campus and The Claw will provide immersive experiences for our community, and become a destination for people across the country and future generations to enjoy. We hope everyone will want to be a part of it. Additionally, we have exclusive naming and sponsorship opportunities available, which you can learn more about here. TEK: Will it be called “The Claw” once it becomes part of the Aquarium? Or will there be a different official name for it as it evolves in its new space? We have an exciting plan that we will unveil in the coming months that will show how it will evolve to become integrated in its new home and how it will help us with our mission of education and teaching people about our planet. We will also have a contest later this year so that everyone can help us pick the new name. TEK: Your press release states this Claw is one of two remaining structures; however, previous articles mention there were once a total of four. Rolling Stone reported that you got the one from North America and one was disassembled. Any clues to where the other (surviving) Claw from the European tour will end up? And if the fourth ever existed? BA: It is my understanding that there were three built and used on U2’s 360 tour, so that assembly, disassembly and transportation could occur simultaneously to meet the tour’s ambitious travel schedule. This is the only one that has found a permanent home in the U.S. The second is still being warehoused in Europe and the third was recycled some time ago for another use. TEK: If the installation is as popular as us fans think it will be, is there any chance of adding a mirrorball lemon to it in the future? BA: Who knows on that, but we were thrilled to learn that the central spire on the stage still has one of the mirror balls from the 360 tour that will be coming to be a part of this installation! That’s a good start at least!